Indian ethnic décor has had a very captivating allure to it. This décor allows us to root ourselves in our past customs and yet be in sync with our contemporary life. Adopting construction methods like Chettinad style flooring, brick finishes or traditional roofing methods like madras roofing or truss system can behold an enticing bid to the Indian design but may involve huge expenses and beforehand planning. 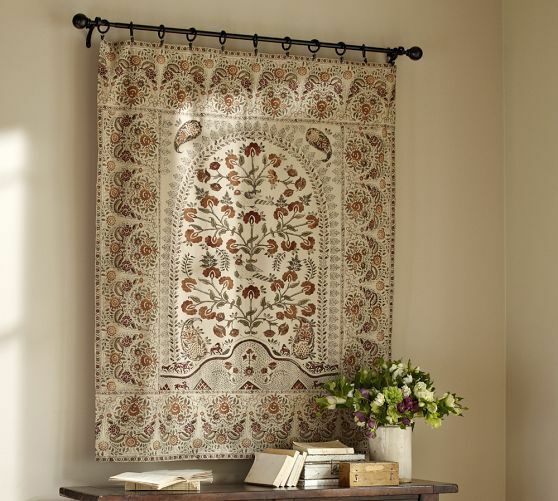 However, one can incorporate small-scale changes and bring about the ambience of the Indian Ethnic Décor into our homes. 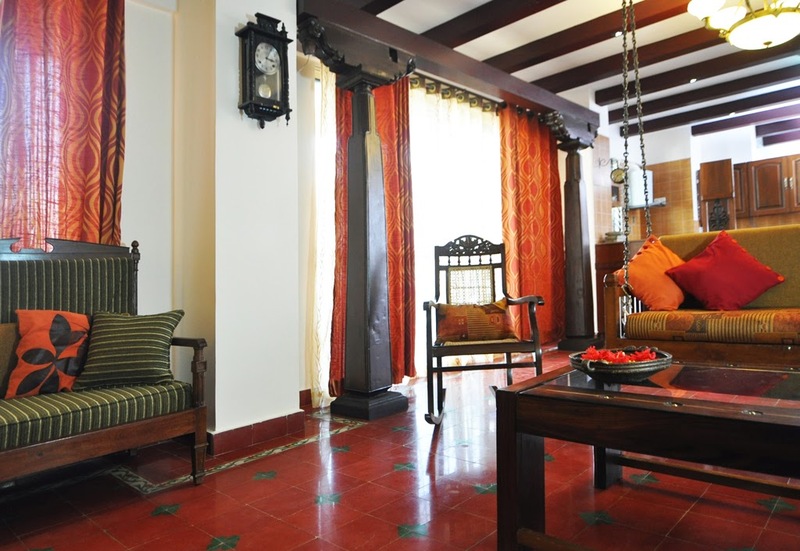 Bright and Vibrant colours tend to be a characteristic feature of Indian interiors. Explore a range of colours within a given palette for your wall paint in order to maintain coherence and to not go overboard. Earthy colours involving yellow mustard or ochre, brown; burnt or mahogany or shades of golden yellow-orange tend to bring out the décor in its’ best form. You can opt for a dash of bright colours interspersed with patterns for the furnishings to stand out from the backdrop. Though black may work in certain spaces, it is better to avoid it for a satisfactory outcome. Intricate patterns and motifs are a significant attribute of the Indian design. Mandala patterns, Warli prints and other themes inspired from nature and community life are common tropes that are adopted. Though many bore a deep spiritual connection, they also serve as a beacon of our culture and ethnicity. You can adopt these patterns in your interiors from flooring; be it floral or mosaic, quilts and upholstery work to tapestries and draperies etc. Fabric can be incorporated in many creative ways in our home; curtains for windows, duvets and quilts, overhead canopy for the bed, etc. Set amidst a subtle backdrop, fabrics tend to beautifully bring out the aesthetics of the furniture it adorns. Pochampally ikat and Brocade are pretty expensive fabrics which depict fine workmanship along with varied other fabrics ranging from khadi to jute can be used for furniture. You can also opt for wall embellishments involving cornices and mouldings or add ornate features to isolated pillars. Solid wood furniture serves as one of the quintessential elements of ethnic décor. Opt for pieces that display rich craftsmanship and a fine grade of wood. For sofa sets, wooden lattice chair sets supplied with cushions, divan or cabriole could serve as primary choices with features involving curved armrests and legs, floral motifs and other engravings. Choose to have one or two highly adorned furniture to serve as a focal point and follow it with other muted furniture for a refined semblance. You can also go with bamboo-woven furniture, especially for outdoor places. Indian décor also has a rich collection of other furnishings involving wooden chests, swing sets, jharokhas, partition screens and ornate footstools. Wooden craft works involving could also double up as wall hangings. Indian traditional cabinets exhibit a unique factor of elegance and prominence. Serving as storage elements, these cabinets boast of exquisite workmanship involving embellishments ranging from carved wooden motifs to inlay work using stones, mirror, etc. Similarly, you can opt for beds with corner posts in your bedroom and complement the overall look with oil lamp shades or candle stands at its side. It is no wonder that India with all its diversity, prides of a rich collection of art and crafts-work. 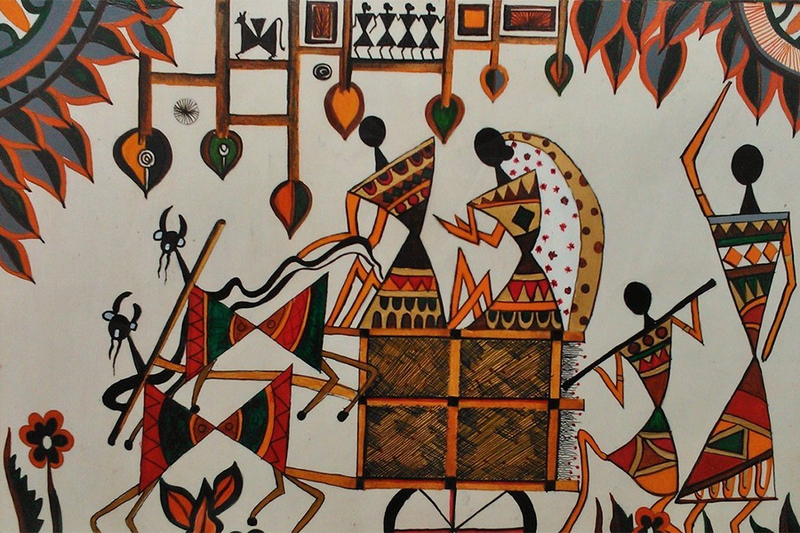 Folk and tribal art in India have taken on different manifestations through varied mediums of expression ranging from pottery, painting, sculpture and metalwork etc. 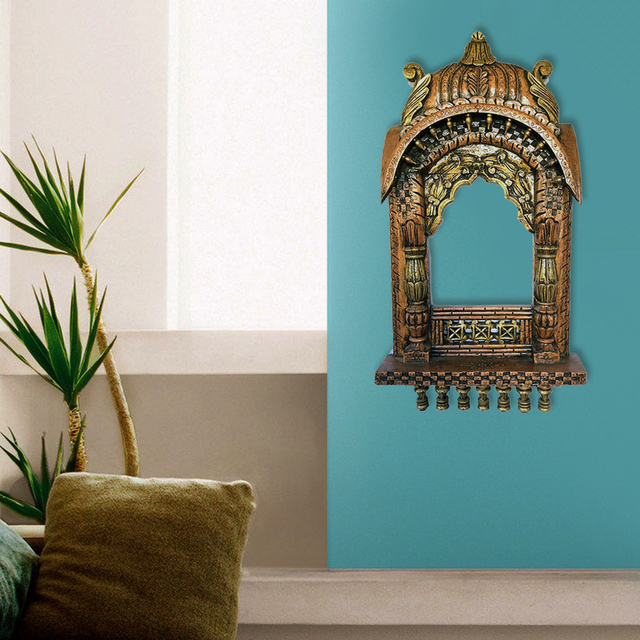 From miniature paintings, kalamkari art to gond and madhubani paintings, we could embellish our homes with these ethnic works and create alluring feature walls. Another important aspect of Indian design is to include statues and idols. Though religious idols tend to be the most commonly used statue figures, you can also explore other figurines representing Indian art, dance and wildlife. India being home to several indigenous handicraft industries has a plethora of ornamental elements to choose from for your ethnic décor. Clay pottery, diyas, crockery elements are some of the elements you can work with. Bellary lambini embroidery, Bidriware and Lacquerware Toys that serve as an enlightening mix of culture and authenticity, can be easily adorned into our homes. Another distinct feature that is found in most Indian homes are the religiously sacred rooms called pooja rooms that are supplemented with congregation spaces. 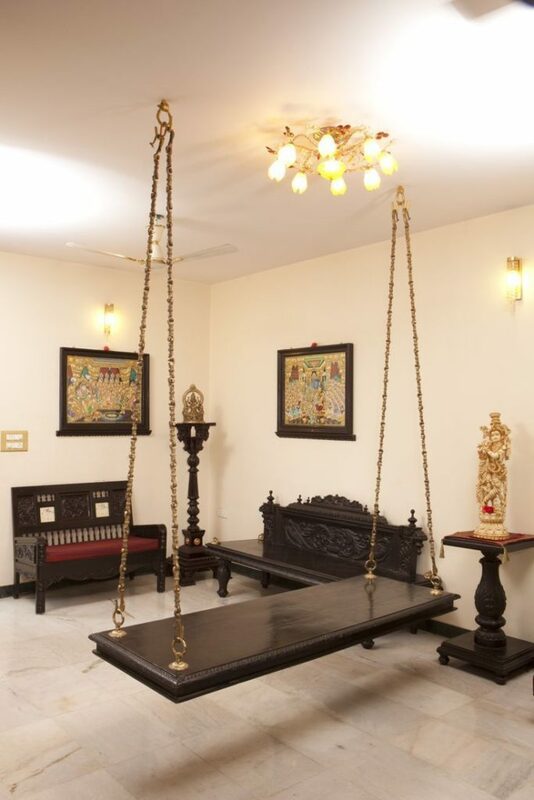 These spaces are often supplied with an array of tiny bells or swing sets called traditional jhoola that add a playful quotient to the ambience of the space. Indian design also revolves around the creation of small informal spaces other than the main living room, that allow for leisure and interaction activities. Mats, floor cushions or diwans help designate these areas.